Cremation is a topic I’ve addressed before but I’m not quite done yet. It fascinates me. Maybe that’s because I didn’t truly consider it an option until recently. Even more interesting to me is the concept of cremation by means of an open-air funeral pyre. The kind of thing you see in movies but rarely see up close. 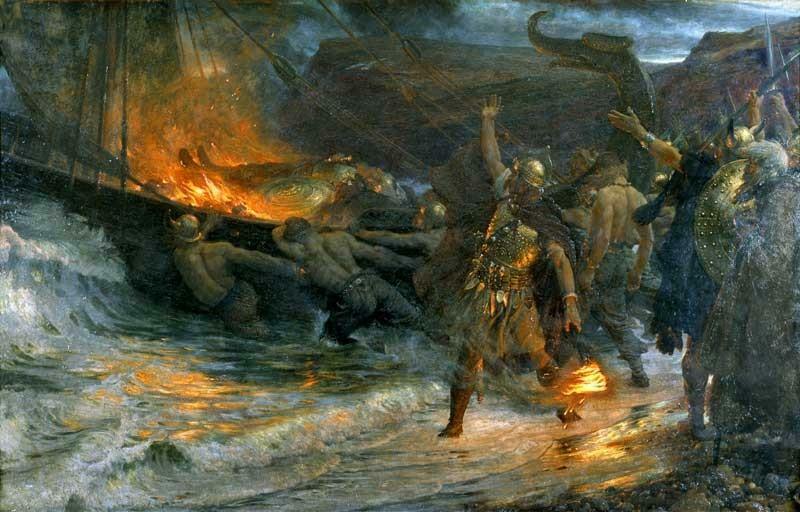 What often comes to mind are movies featuring Viking funerals in which a boat carrying the deceased is lit afire with flaming arrows. In truth, such ceremonies were rare since one had to burn a boat in the process and you had to be fairly well off to own one in the first place. This is what comes to mind when most people think about Viking funerals. In reality, it was a rare occurrence. Today, at least in the U.S., performing one is illegal. You can’t recreate your own Viking funeral in the U.S. today unless you want to end up in jail. The closest you can come is what the band Gwar did for their frontman Dave Brockie this year. They launched a boat containing his stage costume on Hadad’s Lake in Richmond, Va., lighting it on fire with a flaming arrow. The first time I saw an open-air funeral pyre was while watching the TV mini-series of James Clavell’s novel, Shogun. The Japanese heroine’s Shinto-based funeral included the pyre her body lie on being set alight. I was only 12 at the time but the image stuck with me. 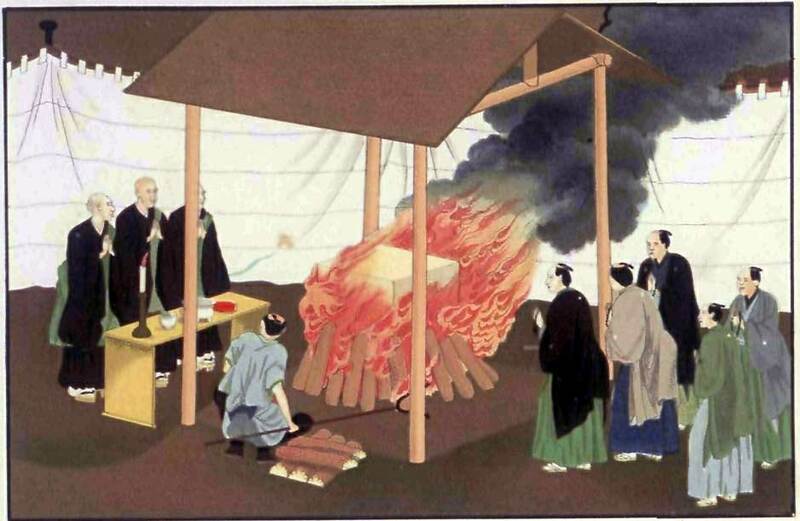 A nineteenth-century illustration of Japanese cremation. 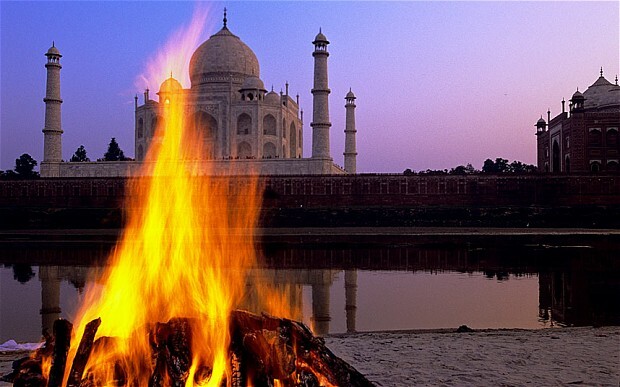 In India, open-air funeral pyres are commonplace. It’s a central part of the Buddhist, Hindu and Sikh religions that dominate that part of the world. In the West, however, it’s very rare. One study alleges that smoke from Hindu funeral pyres, Muslim cemeteries and Buddhist temples account for 25 percent of the greenhouse gases blamed for global warming on the Indian subcontinent and melting of Himalayan glaciers. Photo courtesy of ALMAY. Because cremation took so long to truly catch on in the U.S., only recently has the idea of having a service that includes an open-air funeral pyre come up. It’s rare for a number of reasons, but mostly because it violates state and local ordinances to perform one unless you get special permission to do so. The 2008 funeral in Indiana for the Dalai Lama’s brother, Thubten J. Norbu, is one example. The wisdom behind that is sound. Untrained laypeople setting fire to corpses in their back yards is just not a good idea. The risk of setting one’s neighborhood on fire is too great. However, there’s one place in the U.S. where you can have this rite performed for you legally: Crestone, Colorado. Crestone, Colo. is a small village at the foot of the western slope of the Sangre de Cristo Range of the Rocky Mountains. 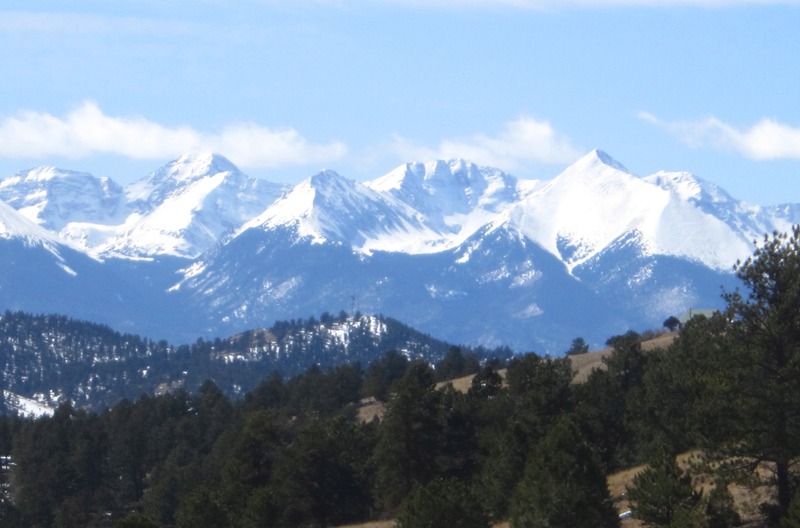 A tiny village about 160 miles from Colorado Springs, Crestone is nestled at the foot of the western slope of the Sangre de Cristo Range of the Rocky Mountains. According to a 2011 CBS report, Sangre De Christo means “blood of Christ,” and legend says the name comes from a Catholic missionary priest whose dying words were “Sangre de Cristo” after seeing a sunset over the mountains. Native Americans are said to have called the area “The Bloodless Valley” because it was so sacred no bloodshed was allowed. With origins like that, it’s little wonder that in recent years, Crestone and the area around it is now home to over a dozen different religious centers. From Roman Catholic Carmelites to Zen Buddhists to New Age devotees, Crestone welcomes all comers. 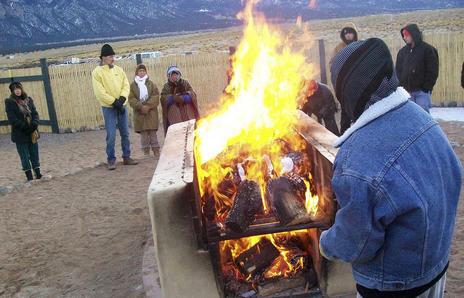 The funeral pyre at Crestone, Colo. is believed to be the only legal site for outdoor cremation in the U.S. Photo courtesy of U.S. Funerals Online. 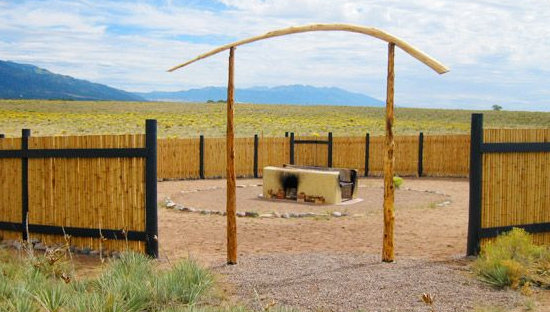 In light of the religious diversity of the community around it (the village itself has a population of around 100), Crestone’s residents were interested in finding alternatives to traditional burial. Out of that effort came the non-profit Crestone End of Life Project (CEOLP). They were especially eager to create a legal outdoor funeral pyre. By 2008, CEOLP had gotten all the required permits and established ties with local hospice workers, the volunteer fire department, county coroner and clerk, as well as a nearby family-run mortuary. Experienced volunteers help with the cremations. They also help families with filling out paperwork and making other needed arrangements. 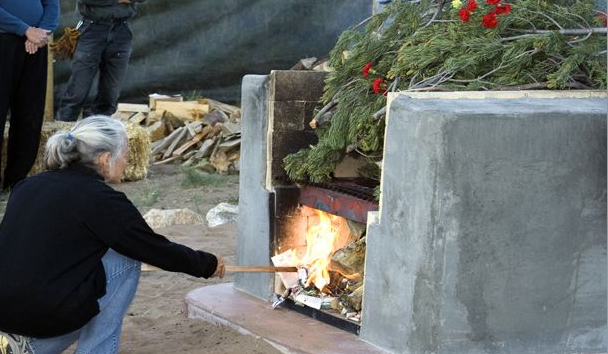 A woman adds wood to the fire beneath Crestone’s pyre during a funeral service. Photo courtesy of U.S. Funerals Online. According to the CEOLP, their “Care of the Body” team assists with washing and anointing the body, and attending to its preservation so the deceased can lie in state at the home for up to 72 hours in order for friends and family to pay their respects. This can involve the use of dry ice and air conditioning to slow down decomposition, unlike the usual embalming process that takes place in a funeral home. So what does an open-air funeral involve? The funeral pyre, constructed from a concrete and brick-lined hearth, is topped with a steel grate. The body is usually wrapped in a simple linen cloth, and then surrounded by juniper logs and branches. If they wish, family and friends can place the torch to the funeral pyre, a ritual that is significant in some religions. How the ceremony itself (which usually takes place early in the morning) is conducted is based on the family’s wishes, from a simple service to one with music, dancing and ceremony. It takes about four to five hours for the body to burn completely. After the pyre has cooled, the ashes are collected. Because there is no way to separate the human ashes from the wood ash, the family receives about five gallons of ashes. Everything about the cremation was personal, intimate and meaningful. We took care of Dad’s body ourselves. We cut the evergreen boughs from our own land. We created our own altar to express the uniqueness of Dad’s life and included his black medical bag and stethoscope, his wedding portrait, and the last photo taken of him four weeks earlier with the nephews (and lobsters!) he loved. We chose his shroud, one I’d brought for him a year ago from the ancient city of Jerusalem. While Belinda Ellis “did not have a religious bone in her body,” according to her husband, Randy Ellis, she had attended a Crestone funeral pyre and told her family it was what she wanted. Ellis, 48, died of a massive heart attack Jan. 9, 2011 and was cremated three days later. Photo courtesy of Ivan Moreno, Associated Press. Before you get the notion that this option sounds good to you, there’s one catch. You have to be a resident of Crestone or the surrounding Baca Grande area (including the little town of Moffat). According to CEOLP, that means you’ve lived there more than three months. They also ask for a donation of $500 to cover expenses incurred. While this rule may seem restrictive to some, CEOLP leaders created it to keep their little corner of the world from being overrun by outsiders and not overburden the all-volunteer operation. As of September 2013, CELOP had performed 32 open-air cremations. While open-air cremation is not something I’d want, I understand why it’s attractive to others. The backdrop of the Rocky Mountains is certainly appealing. I can believe that outdoor cremation can be a moving experience in which to participate. But if for some reason I do choose this route, please don’t play “Light My Fire” by the Doors at the service. 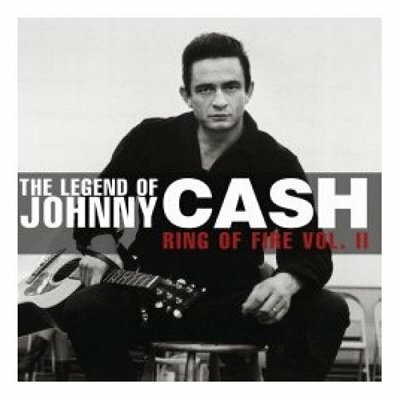 I’d prefer “Ring of Fire” by Johnny Cash. Too much of this and we will no longer have “Adventures”. Of course I have overstated this but frankly I do fear that should Jesus tarry, cremation does present a threat to cemeteries, at least the growth that we have come to expect. On the other hand it could turn out that as fewer and fear people do the traditional burial, the more revered our beloved cemeteries will become. I enjoy so much your blog, and I am proud you are from my much beloved Southern Land.